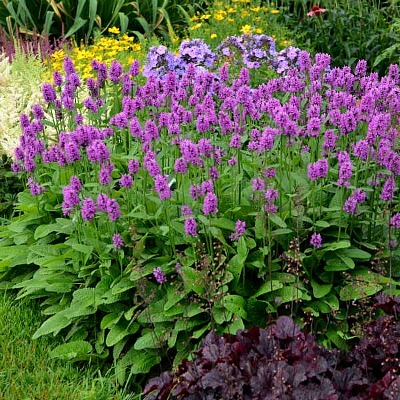 The Stachys monieri Hummelo blossoms in early summer bringing forth beautiful bright purple flowers. It has a deep green color foliage, with a large flower head. It will do well on an alkaline or even acidic soil, and also loves it when exposed to full sun. A fully grown Hummelo plant will grow up to eighteen to twenty inches, with a spread of about 18-20 inches. The bright purple flowers attract bees for nectar collection, and is also good for flower cutting. It is both deer and rabbit resistant. Taking care of this plant is very easy. It does require average moist soil. You may therefore, mulch the soil around it, or water regularly for better performance. You should only do this over the growing seasons though. Planting can be done late winter to spring so as to ensure that the plant is ready to bloom by the beginning of summer. Since this plant requires plenty of direct sunlight, it is best grown outdoors. Occasionally you may need to check your plant for caterpillars and mites since they feed on them. Planting them in masses will make your compound very beautiful. The plant is breathtakingly beautiful, and will form a dense ground cover, when planted in mass. It will also do well in a container or a pot. As with other lambs ears, it attracts insects - mostly bee for nectar collection. No wonder this lovely plant has been named Perennial Plant of the Year 2019. Thank you to Walters Gardens for their beautiful picture of the Hummelo Lambs Ear. Plants shipping to west coast states may be partially bare rooted for shipping.